Alchemy in the Kitchen: Double-Hazelnut Vanilla Caramel Cake – quite a character! 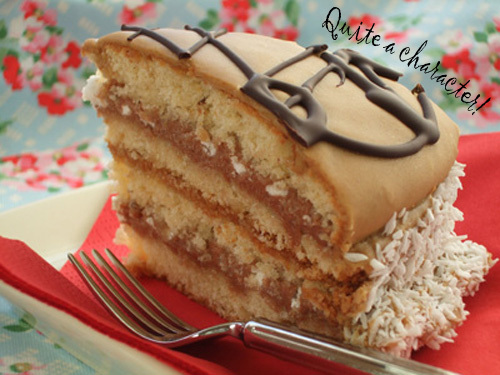 Double-Hazelnut Vanilla Caramel Cake – quite a character! I read Kathryn Stockett’s The Help over the summer, and I cannot get one of the characters out of my mind. Appearing almost as often as the main protagonist, Minnie’s Caramel Cake seems to be a huge part of the story. It made me hungry every time I picked up the book. I’ve tried to find a definitive recipe for Caramel Cake, but – like Irish stew – it appears to be one of those recipes that no matter what version you use, you’ll set someone’s tongue a-tutting. Soooooo, I’m not going to try and recreate a Caramel Cake. I am going to make a Double-Hazelnut Vanilla Caramel Cake – hazelnut sponge cake, with a layer of creamy Nutella filling, slip in some crushed meringue, add a layer of caramel, another layer of Nutella/meringue filling. Top this sugar-fest with more caramel - the filling doubles as frosting. You’ll need a sugar thermometer for the caramel topping. · First, butter and base-line two 23cm sandwich tins. · In a large mixing bowl (or food mixer) beat together the soft butter and sugar until fluffy and paler in colour. · In a jug, mix together the eggs, milk and vanilla extract. · In another bowl, mix together the flour and baking powder. · Slowly add about a quarter of the egg mixture to the butter, beating continuously until combined. Then, add about a quarter of the flour mixture. Continue beating while you add alternate lots of egg and flour to the butter mixture until both have been used up. · Finally, add in the toasted hazelnuts and mix until just combined. · Divide the mixture between the two buttered, base-lined sandwich tins and bake in the pre-heated oven for 30 minutes. Prod lightly with a finger. The sponges should spring back. If not, give them another 5 minutes or so and test again. · Leave to cool in the tin for about 10 minutes before turning out onto a wire rack. Leave to cool completely. · Place the sugar, milk and treacle in a saucepan and stir together over a low heat until the sugar has melted. Turn up the heat a little, stirring continuously, until the mixture is bubbling and has reached the ‘soft ball’ mark on your sugar thermometer (116°C or 240°F). Don’t worry if the milk separates. It will all come together in the end. · As soon as it has reached the ‘soft ball’ stage, remove it from the heat and add the butter, letting it melt. Stir the melted butter into the mixture – it will seem like this is never going to happen at first, but persist! When the butter has vanished into the mixture, stir in the condensed milk and vanilla extract. · Leave the mixture to get cold, beating occasionally to break up the surface crust that forms as it cools. · Split each of the cakes and fill both with the Nutella mixture. Sprinkle the filling with crushed meringue before joining the cake halves together again. · Pour a generous layer of caramel on top of one cake and stack the other cake on top. · Pour the rest of the caramel over the stacked cakes, smoothing with a palate knife. Ensure that the sides are covered. · At this stage it looks very brown so I coat the sides with chopped toasted hazelnuts (that makes it triple hazelnut!) or desiccated coconut and drizzle the top with dark chocolate which sets hard and makes a lovely contrast to the soft caramel. You may have other decorating ideas. Either way, prepare for a sugar rush. Use ready-made caramel or Dulche de Leche in place of the caramel frosting if you want to save yourself a bit of stirring. Thank you dainty apron! And thanks for the great news that food gawker has finally accepted a photo - I must be getting better at taking shots. Oh...my...goodness! That cake looks heavenly! All the different components sound amazingly delicious. I definitely want to give this a try! "Divide the mixture between the two buttered, base-lined sandwich tins and bake in the pre-heated oven for 30 minutes." @ anonymous - good guess on the temperature. The sugar had probably gone to my brain when I was writing that up! Thanks for letting me know. That has now been updated in the post. You were right - 160C in a fan oven (or 180C regular convection oven).